I’d like to welcome you to the Albion Sewalong… and to our new site, Sewalongs.com! For the next month, we’ll be walking you through the process of creating either the Albion duffle coat (version 1) or the unlined jacket (version 2). 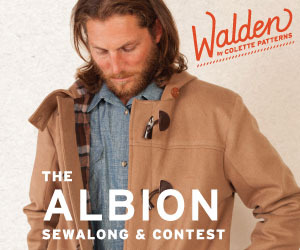 To get started, you’ll need a copy of the Albion pattern from Colette Patterns. Also, be sure to join our brand new Sewalongs Facebook group! There, you can post pictures, ask questions, or help each other out as you sew. We also have a companion guide available for this sewalong. Our companion guides take all of the step-by-step information from our sewalongs, plus extra tips and techniques, and combine them into one beautiful little ebook. It’s a great choice if you want to step ahead of the sewalong, or want to have a book to refer back to in the future. Our sewalongs are simple. 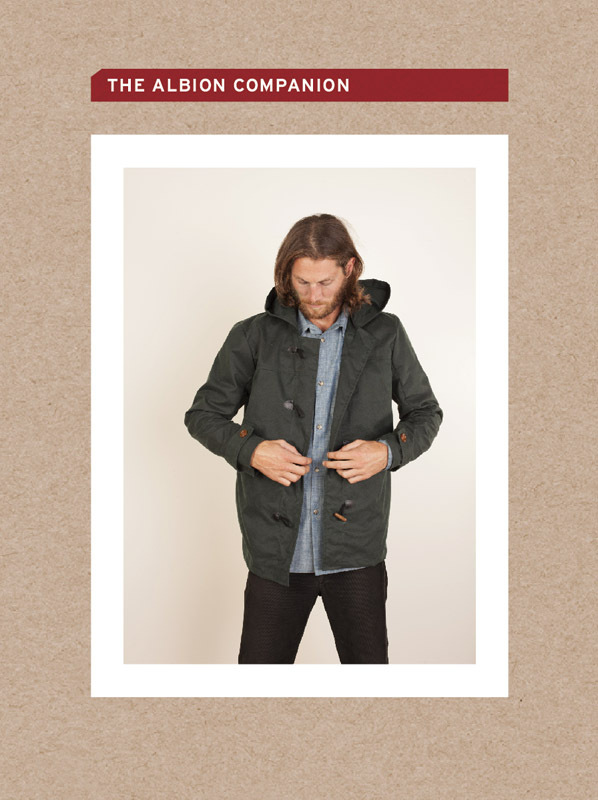 We’ll publish a series of posts detailing each step in the process of fitting and sewing your coat or jacket. You can sew along with us, ask questions, and share your techniques and advice with others. Today, we’ll begin with fabric and supplies (reposted from our blog a couple weeks ago). Next week, we’ll be starting with fitting, covering several of the most common pattern adjustments for both men and women. The first few adjustments could be useful to both, while the following three are common adjustments women might use. We’ll then move into the basics of construction, taking you through each step. Note that while there are a lot of steps listed in the schedule, many of them are optional adjustments and customizations. By the end, you’ll have a beautiful coat or jacket that you can enter into our contest for a chance to win a Bernina 380 sewing machine or other prizes. Scroll down to see the full schedule with dates. One thing we’ve started doing with our most in-depth sewalongs is packaging up all the step-by-step materials along with additional techniques and ideas you might use into a lovely downloadable ebook. You want to skip ahead. The sewalong will be posted on a schedule over the course of the month, but having the companion guide gives you access to all the same information and more at once. You can do it at whatever pace you like. You want to flip through instructions on your iPad or tablet. This is one of the things I love best about an ebook format. You can easily flip through the steps page-by-page instead of scrolling, which is a really nice experience while you’re sewing. You want an all-in-one reference. One you download a guide, it’s yours to keep and refer back to for this or other similar projects. The guide contains lots of additional tips and tutorials to reference, all in one place. Head over to the Colette Patterns shop to purchase the Albion Companion guide. Grab one of these optional buttons for your blog to show your participation, and check out the first post today on supplies, if you haven’t read it. We’ll see you again Monday! Sarai, Thank you for this sewalong! This is my first. A friend introduced me to your book a year and a half ago. I am deeply grateful to you for teaching me to sew! I’m serious! I knew nothing and now I am wearing the cloths I make! I LOVE every pattern I have made of yours and I am so excited to do this Albion for my husband. Blessings to you Sarai! Great job on this new website and thanks for adding the previous sew-alongs! One question: the first posts of the sew along will be about adjusting the paatern so I guess it´s best to wait before actually cutting out our fabric? So can this be altered for a woman/ myself?